The Aroon indicator is used to determine and measure the trend of a stock and it can also be used to spot consolidations in price trends. In this article we will briefly explain how it is calculated and we will also show how it can be used in our screener. Where 25 is the default value of the indicator parameter and ‘period’ is the timeframe used. On a daily chart this reads: “days since the 25 day high”. 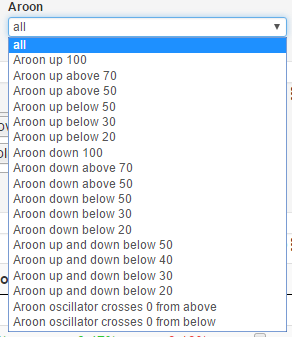 The Aroon-Up is a value between 0 and 100 indicating how long ago the 25 day high was set. It will be 100 when there is a 25 day high today and it will be 0 when this high was 25 days ago. Therefor we can say that when the Aroon-up is close to 100 (for instance above 70 or 90) we will have a strong trend where new highs are being made. The Aroon-Down is a value between 0 and 100 indicating how long ago the 25 day low was set. It will be 100 on the day of a new 25 day low and decrease as the low was set a longer time ago. 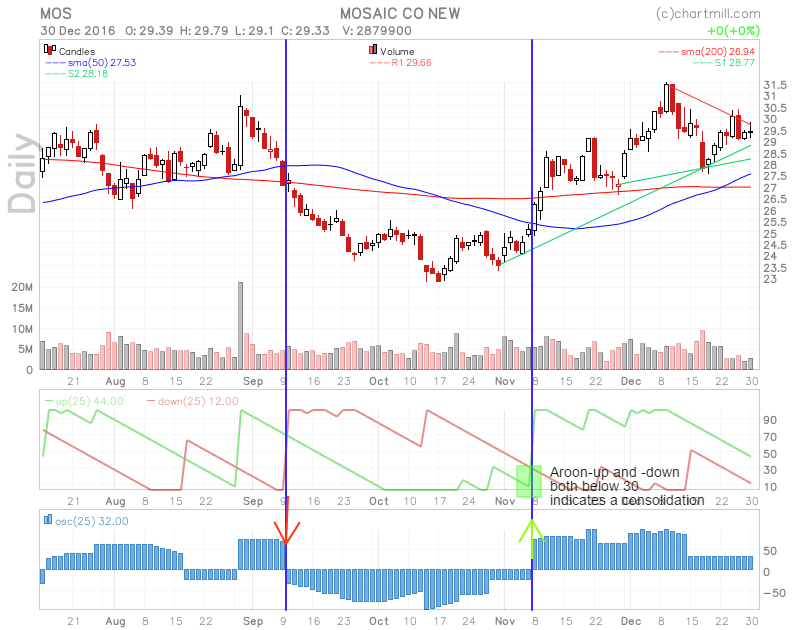 We can say that there is a strong downtrend when Aroon-Down levels are high most of the time. When both Aroon indicators have a low value (below 50 or lower) we can say that a consolidation is taking place because in the last weeks no short term new highs or lows were set. The indicator will cross the zero level when the Aroon indicators cross on the chart. When the Aroon Oscillator is above zero a rising trend is occurring, while a downtrend will be the case when the indicator is below zero. When the indicator crosses the zero level, a new trend may emerge. The crossovers of the Aroon Oscillator indicate turnarounds in trends. Just before the new rising trend, both Aroon indicators were at low levels, indicating a consolidation. An example screens can be found here: spotting consolidations with the Aroon indicator. You can easily adapt the example to your own needs.